Successfully Added WMA + MP3 Player Sunglasses 1GB - Stereo Sound Effect to your Shopping Cart. WMA + MP3 Player Sunglasses 1GB - Stereo Sound Effect. Cool looking sunglasses / MP3 shades with 1GB + MP3 and WMA player built in as well as high quality earphones for great stereo effects. Great for making a statement as well as listening to your favorite music, these MP3 sunglasses will fit virtually adult with swiveling and extendable earphones, and with the flip up glasses design, you won't even have to take the sunglasses off in low light salutations. With the included hard case and lens care cloth, keeping your sunglasses in great condition is easy and convenient. In stock now, buy either a single piece sample for yourself or in bulk for resale with full confidence you will be getting a great product to feature in your internet store or online auctions. on 2009-02-04 08:08:04 Superb for the price! With the "brand name" sunglasses into the price range of hundreds of dollars, I didn't think these glasses had a chance. When I got them though, they far exceeded my expectations! The volume is good for any activity, including running, driving, bike riding or any outdoor activity. The software id not work, but it is not necessary for anyone running Microsoft Windows. I used XP and they worked great. The fit for me was great, they fit snug and won't come off and really can be adjusted for any size. Thanks! 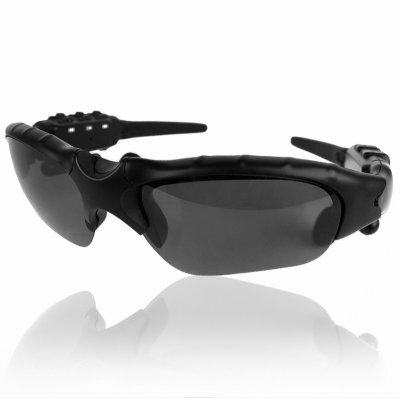 These Sunglasses MP3 players are great, They have a good sound, and are easy to use, no tangleing cables, And one hardly notice's when you are wearing them and they don't hurt for long term wearing of them. It is ideal for Bushwalking. Besides, They are also good Eye protection, without having to wear glasses over Headphones. Maybe we'll see a 4-GB model one day. A bit bulky, but very good sound quality. Enough volume to hear while riding in a car with the windows down. Documentation/instruction manual is very poor, though operation is pretty easy to figure out. I would like them better if the bows bent behind the ear instead of being straight. But for the most part, a good pair of glasses for the money.